OpenWorld Salesforce.com CEO Marc Benioff probably didn’t want to be at Oracle's OpenWorld extravaganza in San Francisco today, even after making a fuss about Oracle yanking his keynote on Wednesday. 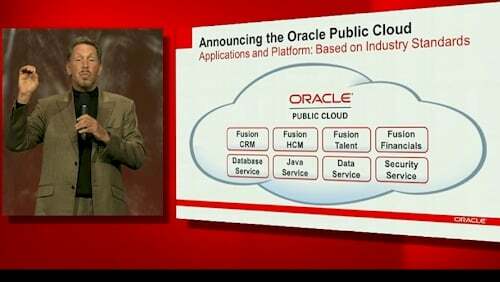 That's because Salesforce.com and SAP were the punching bags this afternoon while Oracle CEO and Benioff's former boss, Larry Ellison announced the availability of the Fusion suite of applications and the Oracle Public Cloud. 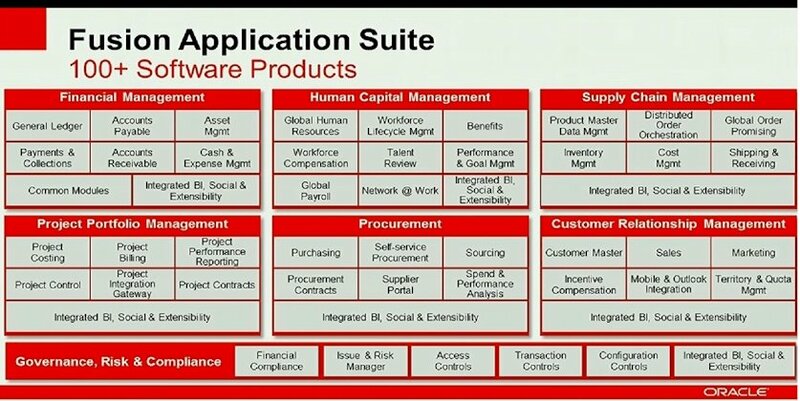 Ellison started off talking about the Fusion apps, a reworking from the ground up of all the business logic embodied in the Oracle E-Business Suite, PeopleSoft, Siebel, JD Edwards, and other applications that the software giant has either built or acquired in the past 15 years. The plan, said Ellison, was to get these Fusion applications out the door in four years, but it took six years. The Fusion suite is written in Java and uses BPEL as a means of linking the apps to outside applications. It includes more than 100 modules encompassing financial, human capital, supply chain, and project portfolio management as well as procurement and governance and compliance apps. Discrete and process manufacturing and wholesale and retail distribution modules are conspicuously absent from the Fusion Apps suite, as are a number of vertical extensions that will no doubt be added for retail, government, healthcare, technology, and other industries. The Fusion apps will not only work from desktop PCs, but can also be accessed from mobile devices like iPads and iPhones, which Ellison showed in action. The important thing about the Fusion applications, explained Ellison, was that they were designed to run on premise as well as in software-as-a-service mode, off premise, in what we now call a cloud. Fusion was built on Java, which Oracle didn't control then as it does now, as well as on a middleware stack (also named Fusion) that used the Business Process Execution Language (BPEL) to link those Fusion application modules to each other over a service bus and to other applications. All of the existing suites out there – including Oracle's E-Business and PeopleSoft as well as SAP and Salesforce – use their own proprietary languages to create those applications: SAP has ABAP, Salesforce has APEX, PeopleSoft has PeopleTools, E-Business had Forms. "Everybody had proprietary languages," explained Ellison. "We thought it was a bad idea." 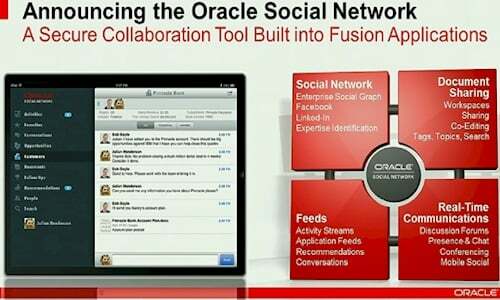 All of these Fusion applications are linked through a new "social network" style interface, which Ellison demoed for about a half hour in his keynote. That interface, he explained, was not supposed to look like a crufty old mainframe or client/server application you tab through to do work, but rather start up with a friendly interface that told you what you, specifically, needed to know as part of your job and list the tasks that you needed to do each day to get your paycheck. The way you negotiate the Fusion apps is driven by work, not by screens. And it has a social media feel to it, with chat, web conferencing, and collaboration built in, not bolted on. The other key differentiator for Fusion apps – and one that Ellison repeatedly used to contrast with the way that Salesforce.com CRM applications are architected – is that the security is not embedded into the application itself, but rather in the virtual machines that contain databases and applications as well as in the middleware, operating system, and databases that support the application. "This is especially important in the cloud and the public Internet," said Ellison. You could feel him building up steam, and everyone was waiting for Ellison to pounce, given all the noise that Benioff made this morning at his own press conference in San Francisco. "If we have a suite of applications running in a cloud, I guess we need a cloud," Ellison said with a big grin. "When ya need a cloud, ya need a cloud. Ours is a bit different." Ellison then brought up a famous comment that Benioff Tweeted during an Ellison OpenWorld keynote a year ago when he said "beware of false clouds." "That is such good advice. I could not have said it better myself," Ellison sneered, rattling off a list of differences between the Oracle Public Cloud and Salesforce.com. The Oracle cloud is built on "standards," by which Ellison meant Java, BPEL, SQL, SOA, Groovy, Web services, and so on, while Salesforce.com is a proprietary cloud platform with proprietary applications, with its APEX language, the Heroku platform cloud, and extensions like Force.com, Appforce, Siteforce, and vmforce. By contrast, the Oracle cloud runs glatt kosher Java and supports Oracle's database and Fusion middleware, which means you can run your applications on premise, in the Oracle Public Cloud, or even Amazon's EC2 cloud. Salesforce.com's applications, said Ellison, run only on its own cloud. "It's kind of the ultimate vendor lock-in," said Ellison, winding the crowd up. "You can check in, but you can't check out. It's stickier than a roach motel." He paused for a second and then added: "It's like an airplane you fly into the cloud and you never come out." Despite the fact that Saleforce.com runs its apps on Oracle databases and thus gives Big Red lots of green, Ellison heaped particular scorn on the multitenancy model that Salesforce.com uses, where the data of customers is all put into a giant Oracle database on the back-end of the Salesforce.com system. This was fine 15 years ago, when multitenancy was the only option for doing application service providing (ASP), the old name for SaaS and now cloud. "We wrote the database, and we think this is a very bad idea," Ellison said. "All of the modern clouds use virtualization as part of your security model." And that is what the Oracle Public Cloud does, keeping each customer's data safe in its own virtual machine.